As promised in yesterday's post, I am continuing to cover the latest data on Irish National Accounts for 1Q 2015. In the first post, I looked at GDP at Factor Cost - the sectoral activity feeding into GDP headline numbers. 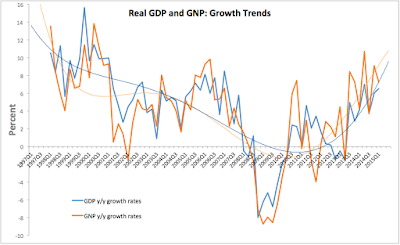 This time around, let's take a look at real GDP and GNP trends. Sectoral activity (measured by the GDP at Factor Cost) added some EUR2.47 billion to the real GDP increase in 1Q 2015 compared to 1Q 2014. This resulted in total real GDP growth of 6.51% y/y in 1Q 2015, up marginally on 4Q 2014 annual rate of growth of 5.98% and significantly higher than 1Q 2014 annual rate of growth of 4.13%. This is strong performance and the good news. From the top headline number, we now have third consecutive quarter (from 3Q 2014) when 4 quarters cumulative output is in excess of pre-crisis peak levels in real (inflation-adjusted) terms. Which is very good news too. Ironically, on GNP side, we now have four consecutive quarters of cumulated 4Q output in excess of pre-crisis peak. Overall, 1Q 2014 marks the seventh consecutive quarter of positive y/y GDP growth. 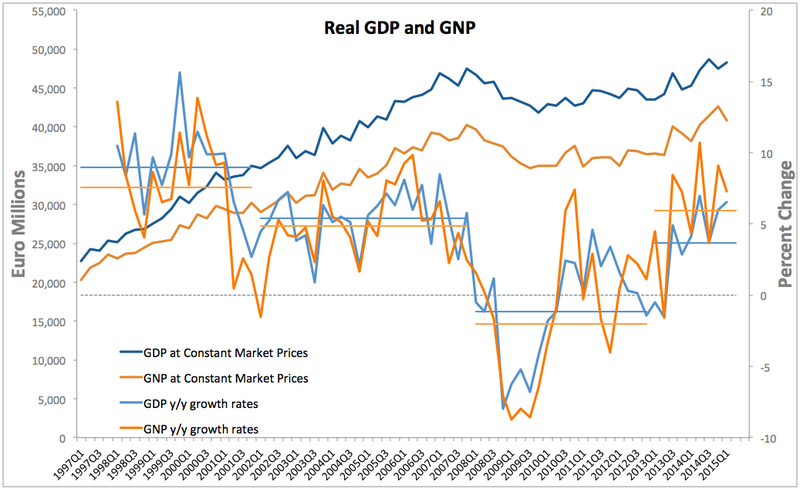 Meanwhile, GNP posted 7.27% growth y/y in 1Q 2015, which was, imagine that, slower than 9.00% expansion recorded in 4Q 2014, but faster than 4.30% growth in 1Q 2014. Normally, we would be exceptionally happy with this rate of GNP growth, but since 2013, GNP figures carry substantial 'pollution' from accelerated tax optimisation schemes known collectively as contract manufacturing. Still, faster growth in GNP than GDP suggests that a lot of growth this quarter is coming from organic, real growth on the ground, although we cannot tell how much exactly. Overall, we now have the seventh consecutive quarter of y/y growth in GNP, which is good. Many profit-generative activities by MNCs are turning into cost-centre activities (booking higher costs into Ireland). 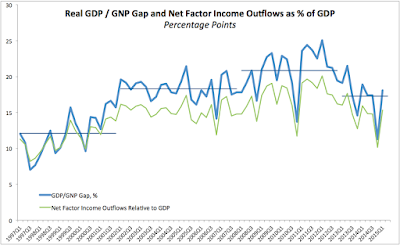 The latter point can be seen by looking at the relationship between GDP and net factor payments abroad, illustrated below in the form of declining share of GDP accounted for by profits & royalties repatriation abroad. This trend is likely to continue and accelerate as MNCs get to more aggressively use our latest tax 'innovation' - the knowledge development box. 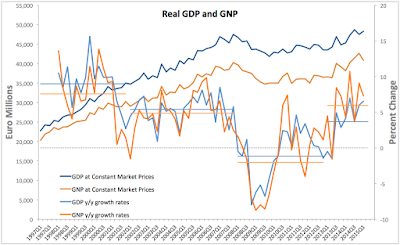 Thus, the chart above gives us some, very indirect, indication of how dodgy are our GNP statistics becoming. Though, more on that in subsequent posts. 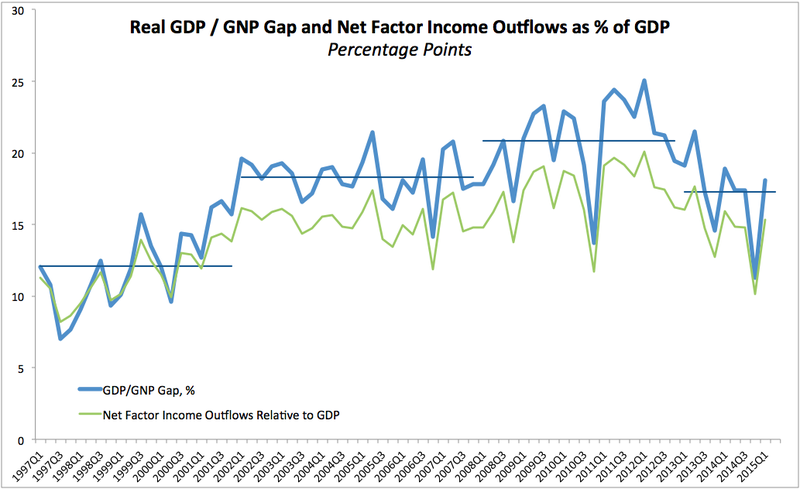 In addition to the net income outflows, the chart above shows the trend of declining GDP/GNP gap. Current 1Q 2015 GDP/GNP gap is at 18.07%, against the average over 2013-present of 17.28% and a 3mo average of 15.58%, which suggests two driving factors: higher GDP activity and increased outflow of booked profits, alongside exchange rates effects. The latter factor is important as it further compounds multiple distortions in the data from the MNCs. In summary, evidence continues to show strong growth performance both in GDP and GNP in real terms, with some lingering questions as to the nature of this growth in relation to the MNCs activities here. Stay tuned for quarterly growth analysis.